In the midst of all that, however, there is still amazing work being done to heal the trauma of violence. 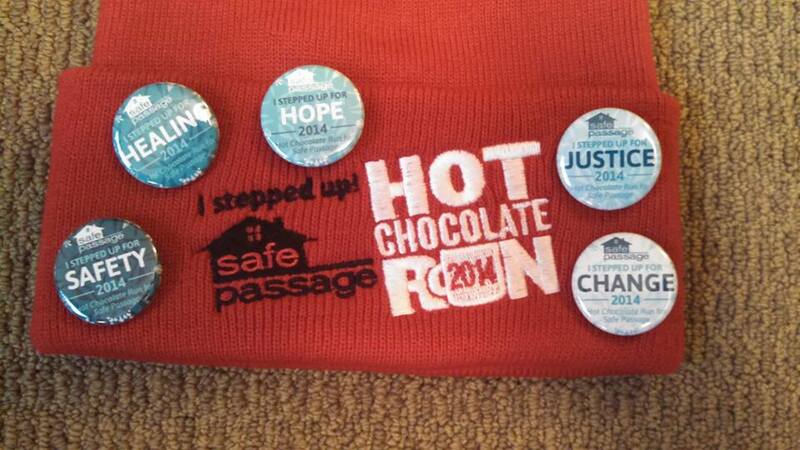 We talk to Sarah Smith, development director of Safe Passage, about this weekend’s Hot Chocolate Run, and how you can Step Up for Healing, Hope, and Change, all while enjoying one of the best events of the year in downtown Northampton. Want to help Bill be less pathetic? Donate to his Hot Chocolate Run page. Want a hand knit hat? Donate $30 or more to Jaz’s page. *Bill was still a little delirious from jet lag and a stomach virus, which is probably why he kept referring to Eric Garner as “Ed.” I eventually heard it and corrected him. Sometimes I’m only paying half-attention to what he’s saying because I’m trying to focus on the equipment he’s saying it into. Get Young for a good cause – or two! 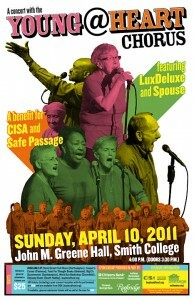 This weekend, the Young@Heart chorus will be performing a benefit for CISA and Safe Passage. During the Valley Free Radio fund drive, we talked to Bob Cilman and Jean Florio from Y@H, and Sarah Smith from Safe Passage. The tickets we offered on the air have been spoken for, but tickets for the show are still available! Get ’em while you can!